For this US Health Insurance Company Review we will be looking at the U.S. Insurance Company of America, which is also known as USICOA. The company has been around since 2007 and is headquartered out of Springfield, Illinois. Although the company offers a number of specialty insurance products and bonds, it does not offer health insurance. You can search for health insurance right now and compare health insurance rates by filling in your zip code in the free quote box. At this time, US Insurance Company provides insurance and bonds for the residents of Illinois and the states surrounding Illinois. The US Insurance Company sells their products through independent brokers only. This means that the agent that you work with will find a product that is best for you and your needs. To find a local broker near you, contact US Insurance Company of America and a representative will find an agent near you. US Insurance Company focuses mainly on two main industries and has products to suit their needs. The two industries are construction and hospitality. US Insurance Company offers contract surety bonds through the US Insurance Agency of America. The bonds available for contractors are payment and performance bonds. The process for applying for a bond varies and is custom designed for the account type and job size. US Insurance Agency of America can service a variety of account sizes. They can help with small accounts that hardly ever need bonds and they can also help established contractors set up a bonding line for a single job of up to $5 million. The submission requirements for contract surety bonds that are less than $200k include a General Indemnity Agreement and the Express Bond Application. The submission requirements for bonds over $200k are more involved. If you have any questions about the requirements or to download an application for a contract surety bond, feel free to contact US Insurance. Commercial surety bonds are available through the MSA Group. There are a number of commercial surety bonds available including permit and license bonds, as well as additional non-contract bonds. If you are looking for welfare & wage bonds, you will need to fill out an application for miscellaneous bonds, which can be downloaded from the website of US Insurance Company. For other commercial surety bonds, you can apply online and be approved by the underwriting department immediately. Because the US Insurance Company only offers their products through independent insurance brokers, any insurance agency that has independent agents associated with it can apply to sell the products offered by US Insurance Company of America. If you own an agency or are an independent broker and would like to fill out an application for an agency contract, you can find the application and download it from the website. Once it is filled out, you can fax it to 217-391-8742 or email it to [email protected]. Once your application is received and reviewed, a representative from the marketing department at US Insurance Company of America will give you a call and discuss everything and answer any questions that you may have. If you would like to find out more about the company and its standing in the community, check out their Better Business Bureau rating. 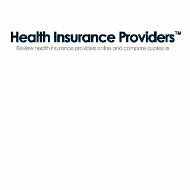 Since US Insurance Company does not offer health insurance, just enter your zip code now to compare health insurance quotes.